Pastors are among the most educated people at work today, but their training is naturally more attuned to matters of the spirit than matters of business. 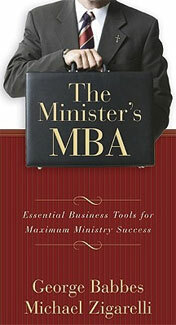 The Minister’s MBA gives ministry leaders more confidence and ability to manage and grow their churches and organizations. The book will also make them more conversant with the businessmen and women who serve on their various boards and committees. Easy-to-follow sections include "The Admissions Exam: Test Your MBA-Q," "Core Curriculum, "Electives," and "Graduation Day."